Many of the world’s largest Cloud providers are established in Telehouse facilities, including Amazon Web Services, Microsoft Azure, Oracle Cloud, Google Cloud Platform, Net Suite and thousands of others. Telehouse provides enterprises with an optimized, intelligent, private network that ensures accelerated access to applications hosted in public, private, or hybrid clouds. Direct connections to all major Cloud providers from our 48 Data Centers in 13 countries and 24 cities worldwide, giving you flexibility and scalability. Major content providers are established in our Data Centers, giving you seamless connections to providers including Facebook and Twitter. Telehouse is home to the world’s major Internet Exchanges including NYIIX (NY), LAIIX (LA), LINX (London), FranceIX, DE-CIX (Frankfurt), JPIX (Japan) and many others, giving you global connectivity in major cities. Connect with over 3,000 business partners in the Telehouse ecosystem. With Enhanced Connect, Telehouse’s new internet optimization service, businesses can access Telehouse Interconnect from the remotest points of the planet in less than 300ms. Telehouse adheres to more than 300 standards for facility specification, facility operation and service operation. We provide 24/7 technical and engineering support and security to protect our customer’s mission-critical data and maintain a high standard of service and reliability. Telehouse guarantees the highest SLA of up to 99.999% globally for power availability. The global locations of Telehouse Cloud Interconnect provide greater speed to market for cloud providers and increased levels of performance for their end users. Connect with over 750 connectivity partners around the world to expand your reach and open new doors for business opportunities. With many of the world’s largest cloud providers already established in Telehouse Data Centers, global businesses benefit from low latency and cost-effective connections. Telehouse has been connecting customers in our global network of Data Centers for over 25 years. We anticipated the growing need for data storage as well as the demand for faster connectivity. We are home to thousands of enterprise partners, cloud providers and carriers, as well as Exchanges such as NYIIX, LAIIX, LINX and many more. With our wide range of partnerships, Telehouse can provide not only services to store the assets customers have, but also the platform for customers to leverage business opportunities in an international community. Our global presence of 48 Data Centers gives you a local partner to help navigate the laws, customs and regulations of other cultures. 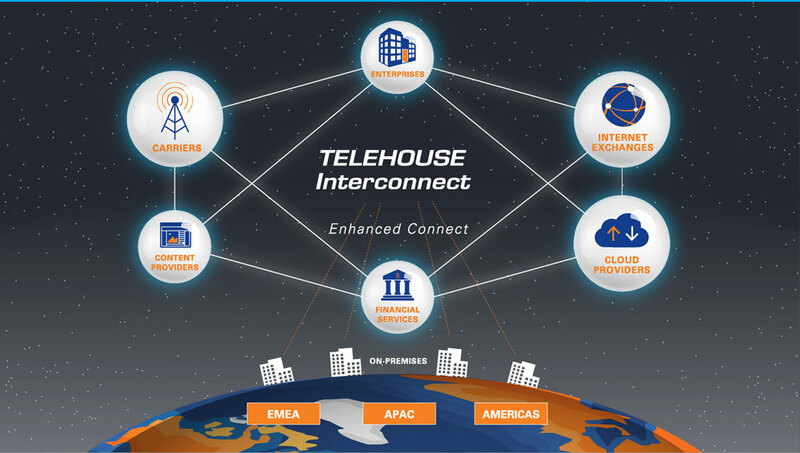 Telehouse Interconnect Community evolves its ecosystem for enterprises and cloud providers.